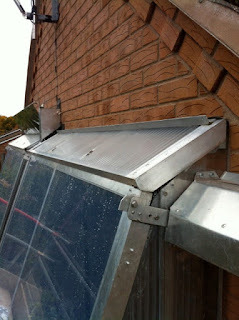 For over 2 years now, I have used the idea of 'mirrors', to act as boosters to the Sunbox by gathering more sunlight. They were intended to improve the solar capture in winter by forcing more heat through the roof part of the Sunbox, as is done with thousands of rural solar cookers in Africa and the Subcontinent. These should be redundant now, with the new ETFE fronts. 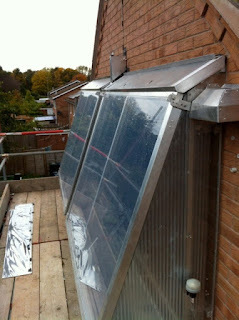 The bare aluminium 'mirrors' helped through the first winter, but became very matt grey after a year of exposure. I then added Mylar film which restored their power somewhat, but the Mylar gets dirty and should really be replaced annually. It is not fun 8 metres up atop a ladder and this is not a task I want to do again - and with the ETFE fronts, I cannot really consider leaning a ladder against the front faces. The upper mirror was only intended to boost sunshine in the winter and this is not necessary any more. This mirror does nothing in the summer because of its 60º angle. 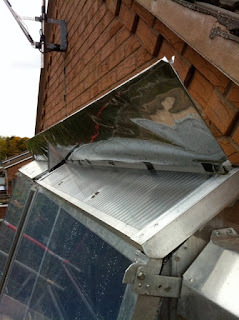 There are internal mirrors in the Sunbox which still reflect light upwards onto the black collectors. They will remain active. We Salute those who are about to die - but they will live again, as the aluminium sheet is very usable for a future project. Five spins of the 5mm drill and the rivets are gone and the mirror is free! Both mirrors gone now, the wall looks a lot tidier, and the Sunbox looks less bulky.